12 photos in database by this submitter. 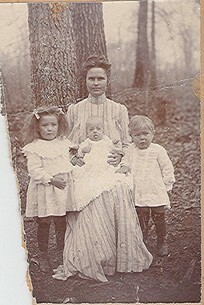 Comments: Laura Yarbrough (Nee: Blair) | TX USA | 1901-1920 | Comments: This is my great grandmother Laura (Blair) Yarbrough with her children, Lula L (on left), John Breckenridge (baby) and my grandfather, Johnie Suiter. Laura died in 1905 in Iowa Park, TX. The back of the picture says ''To Mr. Bud Blair and wife. From D. T. Yarbrough, wife and children. If anyone knows anything about Laura or Bud Blair, please contact me. Thanks. NEW INFO: Laura's parents were SJ and Mary A Blair. Her siblings were Ella, William, Ora, Theodocia and James.